"A FUN-FILLED ADVENTURE BECOMES A LIFE-THREATENING ODYSSEY!" Most twelve year old girls are into fashion, dance class, and music. But not Samantha Conway. Unlike her classmates, she lives in a world of her own. Sam gets her thrills on the baseball field, seeking revenge on the Mack Pack, and playing Town Security. Sam's high level of intelligence, curiosity and moral support from tyler turns her thrilling adventures into an unforgettable terrifying experience that will get your adrenalin flowing. When Sam's father proudly gives her a new toy, did he put his invention into the wrong hands? What did Sam do with the Sound Shooter, how far did she go, and how far is too far? Sam's new toy offered intriguing possibilities, but did it also direct her to danger? Where did the Mack Pack chase Sam and Tyler, who becomes the predator, and who becomes the prey? Who came up with the plan to become the Stingers? Why did Sam and Tyler go to Jones Beach, who were they looking for? What made Tyler's mom cry uncontrollably, and was Sam's mission accomplished? Why did Clemency give Jack and Jimmy their jobs back, with a fifty-percent raise? Who revealed Sam's identity to the mob? Did Sam manipulate Giovanni Scardino, and at what point does adventure turn into chaos? I highly recommend this action-packed novel to all adventure lovers who enjoy loads of unending fun, combined with drama and suspense. W.G. 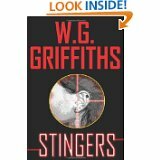 Griffiths takes the reader on one thrilling adventure that begins as delightful, and ends in a heart-pounding chase for survival. The author creates a clever, steadily engrossing thriller that entertains with colorful characters and powerful events page-after-page. How did Sam think that she was helping her father, why did Jack dislike Clemency, and was Jack in danger with Giovanni? Why did Giovanni fake a heart attack, did Tyler discourage Sam from spying at the Scardino estate, and was the Sound Shooter used in the conversation that Scardino had with his lawyer? Who saved Tyler's life from drowning, and how did Giovanni find out that Sam was hiding in his yard? How does the Sound Shooter wind up in the hands of a major organized crime boss? The game has ended, the fun is over for Sam and Tyler, time is running out as they run for their lives, who will survive? "STINGERS" is as captivating as WILD AMERICA and is as thrilling as THE JUROR, with Demi Moore, and Alec Baldwin. This book is an awesome read, very entertaining.Highly recommended. I totally agree. Thank you Susan for Visiting & Commenting!